Researchers at North Carolina State University have developed a smart coating that helps surgical implants bond more closely with bone and ward off infection. When patients have hip, knee or dental replacement surgery, they run the risk of having their bodies reject the implant. But the smart coating developed at NC State mitigates that risk by fostering bone growth into the implant. The coating creates a crystalline layer next to the implant, and a mostly amorphous outer layer that touches the surrounding bone. The amorphous layer dissolves over time, releasing calcium and phosphate, which encourages bone growth. ’The bone grows into the coating as the amorphous layer dissolves, resulting in improved bonding, or osseointegration,’ said Dr Afsaneh Rabiei, an NC State associate professor of mechanical and aerospace engineering. The bonding also makes the implant more functional, because the bonding helps ensure that the bone and the implant do a better job of sharing the load. ’We call it a smart coating because we can tailor the rate at which the amorphous layer dissolves to match the bone growth rate of each patient,’ Rabiei added. This is important because people have very different rates of bone growth. For example, young people’s bones tend to grow far faster than the bones of older adults. 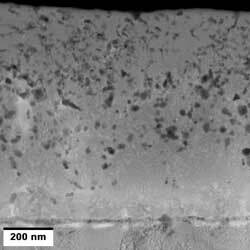 The researchers have also incorporated silver nanoparticles throughout the coating to ward off infections. Currently, implant patients are subjected to an intense regimen of antibiotics to prevent infection immediately following surgery. However, the site of the implant will always remain vulnerable to infection. But by incorporating silver into the coating, the silver particles will act as antimicrobial agents as the amorphous layer dissolves. This will not only limit the amount of antibiotics patients will need following surgery, but will provide protection from infection at the implant site for the life of the implant. Moreover, the silver is released more quickly right after surgery, when there is more risk of infection, due to the faster dissolution of the amorphous layer of the coating. Silver release will slow down while the patient is healing.